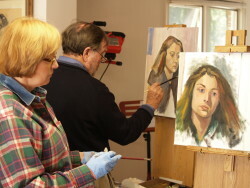 Robert offers professional, personalized coaching & critiquing services to those serious about a career as a fine artist or commission portrait artist. Robert offers one-on-one coaching, addressing the issues that stand in the way of you realizing your career goals as a professional artist. There are many paths to success, which are often difficult to see. Robert will help you find your path, putting his over 30 years of experience of trial and error to work for you. Each program is tailored to your specific needs. Regular consulting, even over the phone, is essential for success. Robert will help you clarify your goals, helping you design and implement a plan of action that holds you accountable to yourself. Robert has helped launch numerous successful careers. Let him help you launch yours. Are you ready to make the leap from the sidelines to the playing field? Is it time to go from a dedicated amateur to the ranks of a professional artist? Is your career in a holding pattern? Need an outside / bird’s eye view of what you’re doing? Discover, clarify, and deepen what you want to achieve as an artist and as a business person. Encourage and challenge you in self-discovery, developing your unique voice as an artist. Help you to generate solutions and strategies that lead to balanced action. Challenge you to be diligent, responsible and accountable in your career. $85 per session or $225 for 4 consecutive weekly sessions. Robert will give you a crash course and professional assessment. Bring some previous work and your dreams for the future and you will will leave inspired and renewed, having a better sense of what you have to contribute as an artist. He will tailor his instruction to your specific needs and desires. $150 / month includes an initial 1 hour consultation by phone or in person, followed by three (3) weekly thirty-minute phone consults over each month. Plus periodic reviews of homework via email. All critiques include one follow-up email to address specific questions about the critique. 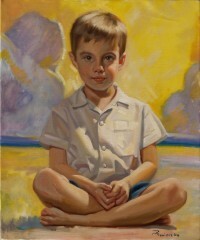 $25 for each additional artwork – limit three works. $85 for a critique of an entire body of work (between 4-15 individual artworks related to one another in some way). What are people saying about Robert’s art instruction?